As we mentioned only a few minutes ago, Aeroplan is one of the easiest program to earn lots of miles with for hotel stays. Earlier we brought you the Aeroplan IHG offer, the Aeroplan Best Western offer and now here is the Accor Hotel offer. Not as many of you may be familiar with Accor as you are BW or IHG. It is a very large hotel chain from France but you'll get to know them a lot more as they bought Fairmont Hotels a few years and are finally integrating the Fairmont Presdident's Club program in their own Le Club AccorHotels later this year. So you will see lots of Accor branding across Canada and around the world at all Fairmont Hotels. That being said, Accor does already have hotels in Canada, 8 to be exact, all are Novotel and Sofitels in Montreal, Ottawa and Toronto. 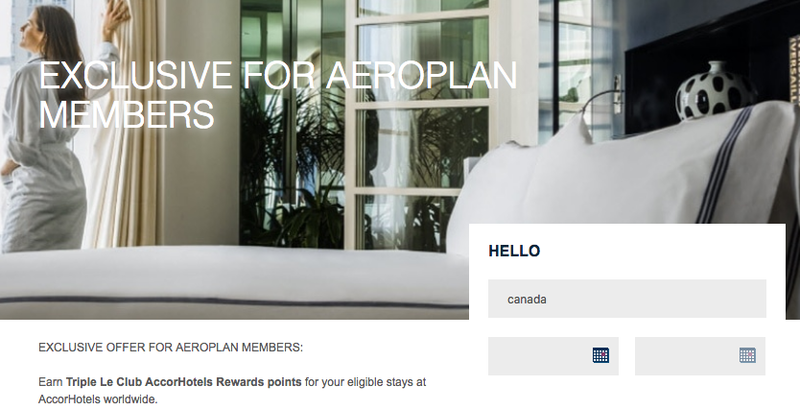 As always this is a good option for those one off stays you might have where it wouldn't be worth it to credit the stay to the Le Club AccorHotels program.